07-22-2008 - The NMCA superbowl for 2008 was one to remember for Team BBNova. The 2 months that followed the NMCA Bowling Green race were both long and short. We were itching to get out yet trying to be as prepared as we could. This race brought back a special person back to the crew, my crew chief Brian Mullaney. This made a full crew of Colleen Chris and Brian, Uncle Alex and Duane. It took a couple hours but Route 66 did a fantastic job of getting the track dry. Once again the NMCA made the call for us so we towed up to the lanes. Feeling pretty good about the tuneup I staged the car and it left fairly hard but pulled very hard the rest of the way down the track. After getting the car stopped once again I made the phone call to Colleen. I was nearly knocked over by news. We were finally back in the 50's with a 7.56@ 182.5. Well that was it for qualifying for the day so we collected all the data and headed back to the hotel. We discussed our game plan for tomorrow and got some sleep. We woke up Saturday morning to rain. Looks like the schedule was going to be cut short as we got the track and waited it out there was news that there was to be no 3rd qualifier for the NPS class. The ladder was set and were sitting 3rd out of like 22 cars. The following is the NMCA's list of the top 16. As we passed him I never saw the car touch down and that was like 300' out. We got the win light and I got the car stopped and again made my phone call. I nearly dropped the phone as Colleen was screaming in the phone. 54..........54.............54. I reaped 7.54? She said yes, 7.54. After getting the ticket and with wide eyes, we finally got a pass I was proud off. the car went 7.544 @ 183.32. The other good news was we were headed to the 3rd round.. The bad news was we were going to have to run Barb and her "old school" '67 Chevy Camaro. 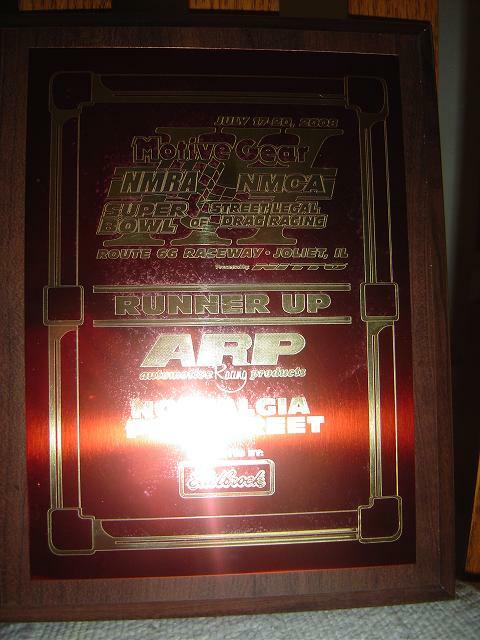 If we got by Barb that would give us a bye into the finals for the 2008 NMCA superbowl of drag racing. Barb and I did our burnouts and I backed up as she did a shorter burnout than us. Barb bumped in first and lit her first bulb. I then inched forward with the help Of Brian and found my prestage bulb. Barb bumped forward and she was final staged. I waited a second and found my bottom bulb and set the trans brake. All of a sudden Barb's car left. The light had not come down. I waited for the tree to come down and left. I ran it out the back door to a 7.59 @ 183mph. That round win put us in the finals with a single in the semi's. There were only 3 cars left in the field. Team BBNova, Weidner, and Colletta. We had the bye. That left a battle of Weidner against Colletta. The call was made for our class once again. This was the 4th round for the NPS class. Weidner and Colleta were the first ones out and Colletta came out with the victory. We made a 300' shot to get some info. All in all it was a great weekend. Myself, Colleen, Chris and Brian had a great time. Team BBNova has been out to 2 of the 4 NMCA races this season with both of those races having us in the final round. With the great showing in Joliet and Bowling Green, Team BBNova is now in 3rd place in points with the NMCA and looks forward to the next event August the 23 in Milan, Michigan. This is our home track. We will be out testing and will have something for team Colletta. We hope for a rematch then!!!!!! !